Many people seem a bit confused by persimmons. Do you cook them or eat them raw? Are they bitter or sweet? How do you eat them? It seems that whenever I buy some, either the person next to me in line or the cashier quizzically looks over and asks what I'll do with them. Everyone seems to have heard a story about some brave soul who tried one and was rewarded with a mouthful of astringent yuckiness. 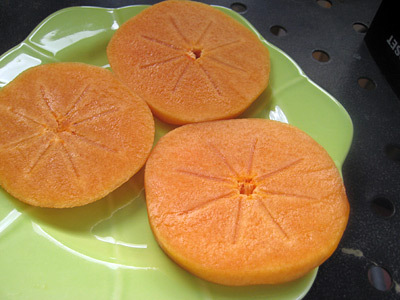 Contrary to popular belief, only one type of persimmon is astringent when unripe -- the Hachiya persimmon. I won’t discuss the Hachiya today, other than to say that it is sugary and bursting with flavor when ripe and is the perfect base for puddings and fruit butters. Rather, I want to focus on the Fuyu, which is non-astringent, has a sweet and gentle flavor, and is often grown locally. It also happens to be delicious. 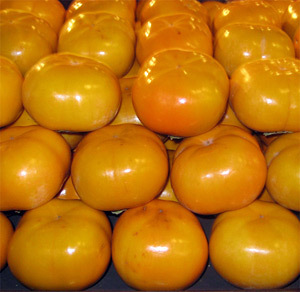 Fuyus are shaped like tomatoes and can range in color from light to deep orange. And, unlike Hachiyas, they can be firm when ripe (like an apple). You can cook with them or eat them raw. They’re great all by themselves as a fruit snack, can be cooked into stews or pies, or included raw in salads. Although you can wait until Fuyus get soft before you eat them, I think they are best when firm and crisp. They are also quite pretty when sliced as their seed holes make a natural star pattern. Just make sure they’re not too light in color (and definitely not greenish) as they’re only sweet when ripe. Here are a few Fuyu persimmon recipes my family and I have been enjoying this Fall. The tart is one of my new favorites, with a sweet and delicate texture and flavor that is perfect for a cold evening. 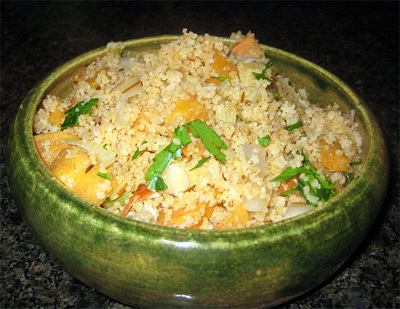 The couscous is fast to make and a great accompaniment to chicken, pork, or a vegetable stew. And, if you’re looking for something fresh, crisp and seasonal, try the salad, which is perfect as part of a family meal and pretty enough to serve to guests. If you've never tried this fantastic seasonal fruit, I hope you give one of these a chance. 1. Preheat oven to 325 degrees. 2. Oil or butter a cookie sheet and set aside. 3. Chop persimmons and pears into 1/2-inch cubes. 4. 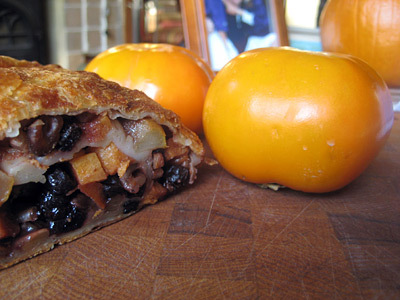 Place persimmons and pear in a bowl and mix in the currants, zest, sugar, walnuts and flour. 5. Roll out your pie crust or puff pastry. 6. Lay out your pastry crust on the cookie sheet and then spoon the fruit filling in a long and full line in the center. 7. Fold the outer edges over the center, overlapping the ends. 8. Fold under the ends and crimp so you have a full seal. 9. If desired, brush on the egg wash and sprinkle the remaining tablespoon of sugar onto the top of the pastry dough. 10. Bake for 40 - 45 minutes or until fully baked. 11. If the top crust starts to brown too much, simply cover it with foil and continue to bake until finished. 1. Chop onions, fennel and persimmons and set aside. 2. Heat olive oil in a medium sauce pan and add onion and fennel. 3. Cook vegetables for about 5 minutes on medium heat, or until fennel and onions are translucent. 4. Add persimmons, salt, almonds, and thyme and cook for another 2 minutes. 5. Stir in couscous and then add hot water or broth along with a little salt to taste. 6. Turn off heat, cover, and let sit for five minutes. 7. Add in parsley, fluff the couscous with a fork and then serve. 1. In a pan, heat pine nuts on medium heat, toasting gently. 2. Sprinkle on the sugar and quickly incorporate it into the nuts so they become lightly coated. 3. Once the sugar starts to meld to the nuts, immediately turn off the heat so you don’t burn the sugar. 4. Place greens, persimmon, pear, and nuts in a salad bowl and mix with your favorite salad dressing.